The Lifetime risk of oesophageal cancer article can now be found on the Oesophageal cancer risk page. In males in the UK, oesophageal cancer is the 9th most common cancer (3% of all new male cancer cases). 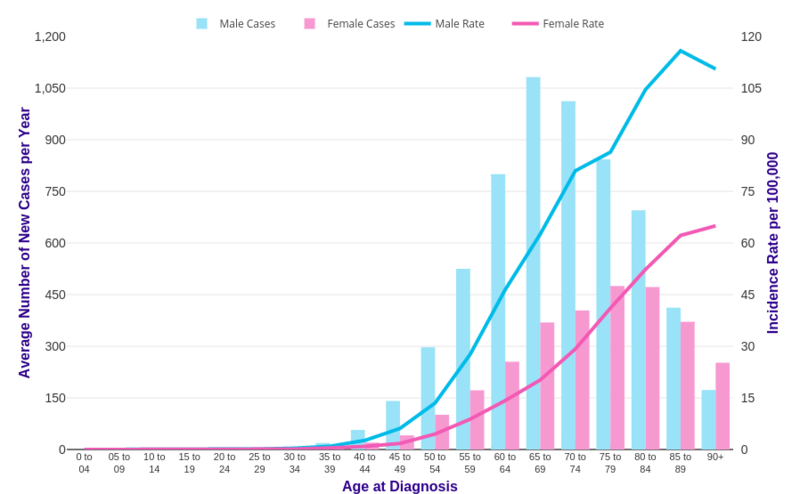 In females in the UK it is the 15th most common cancer (2% of all new female cancer cases). 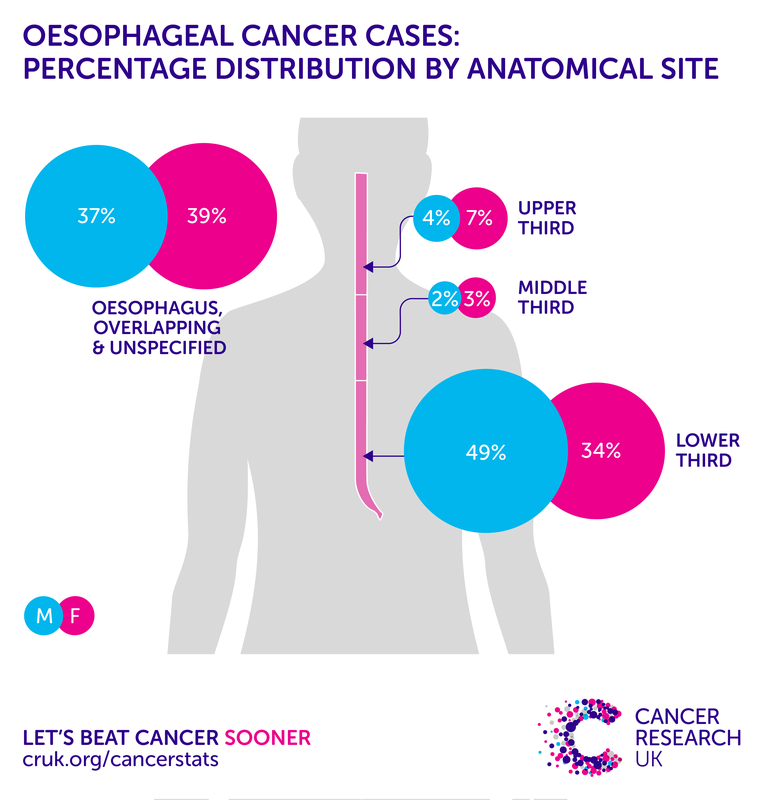 68% of oesophageal cancer cases in the UK are in males, and 32% are in females. 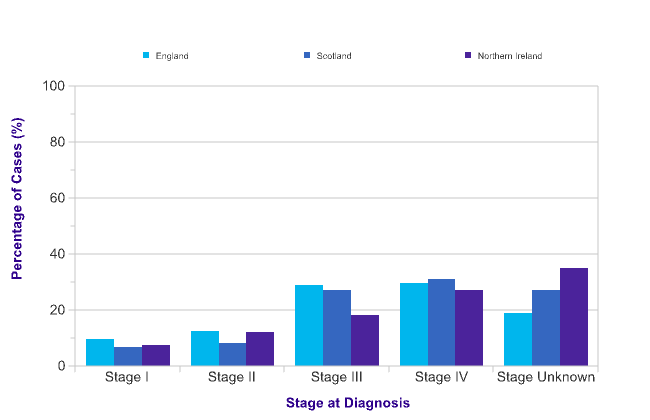 Oesophageal cancer incidence rates (European age-standardised (AS) rates ) for persons are significantly higher than the UK average in Scotland, significantly lower than the UK average in Northern Ireland, and similar to the UK average in all other UK constituent countries. For oesophageal cancer, like most cancer types, differences between countries largely reflect risk factor prevalence in years past. Data is for UK, 2015, ICD-10 C15. Age-specific incidence rates rise steeply from around age 45-49. The highest rates are in the 85 to 89 age group for males and the 90+ age group for females. Incidence rates are significantly higher in males than females in a number of (mainly older) age groups. The gap is widest at age 45 to 49, when the age-specific incidence rate is 3.5 times higher in males than females. For oesophageal cancer, like most cancer types, incidence increases with age. This largely reflects cell DNA damage accumulating over time. Damage can result from biological processes or from exposure to risk factors. A drop or plateau in incidence in the oldest age groups often indicates reduced diagnostic activity perhaps due to general ill health. Data is for UK, 2013-2015, ICD-10 C15. 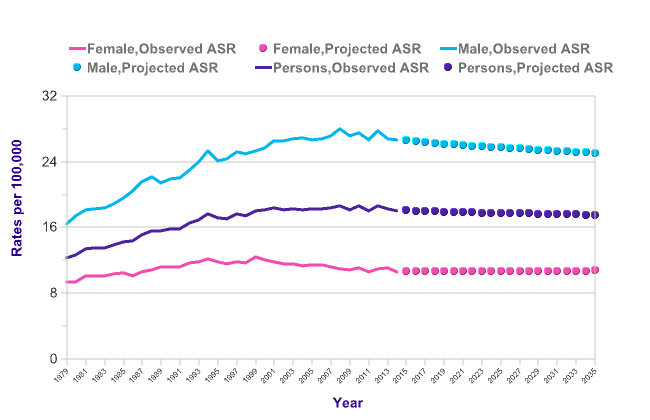 Oesophageal cancer European age-standardised (AS) incidence rates for males and females combined increased by 6% in the UK between 1993-1995 and 2013-2015. [1-4] The change varied markedly between sexes. For males, oesophageal cancer AS incidence rates in the UK increased by 10% between 1993-1995 and 2013-2015. For females, oesophageal cancer AS incidence rates in the UK decreased by 9% between 1993-1995 and 2013-2015. 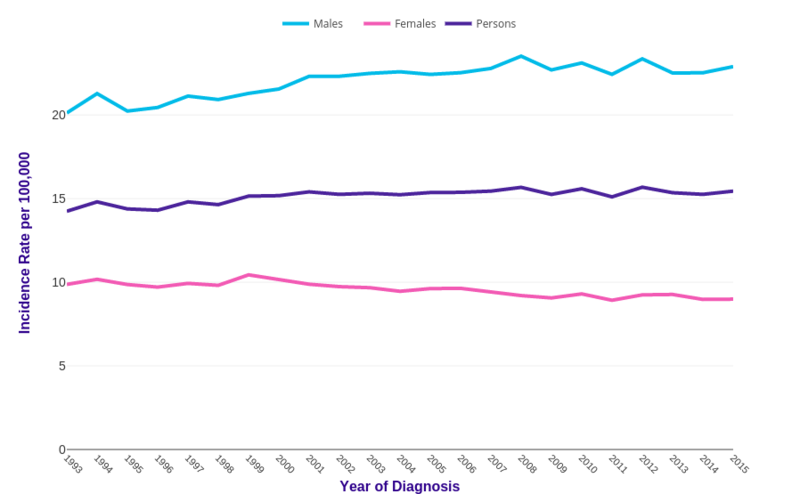 Over the last decade in the UK (between 2003-2005 and 2013-2015), oesophageal cancer AS incidence rates for males and females combined remained stable. [1-4] In males AS incidence rates remained stable, and in females rates decreased by 5%. 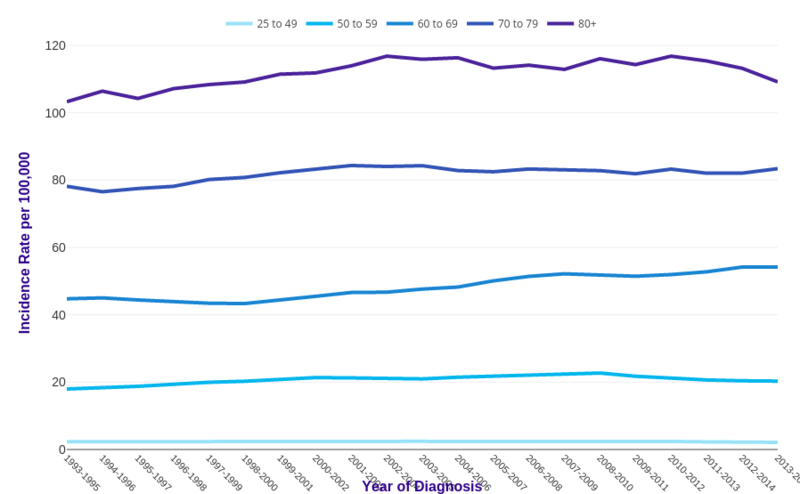 Oesophageal cancer incidence rates have increased overall in some broad adult age groups in males in the UK since the early 1990s, but have remained stable in others. [1-4] Rates in 25-49s have remained stable, in 50-59s have increased by 13%, in 60-69s have increased by 21%, in 70-79s have increased by 7%, and in 80+s have remained stable. 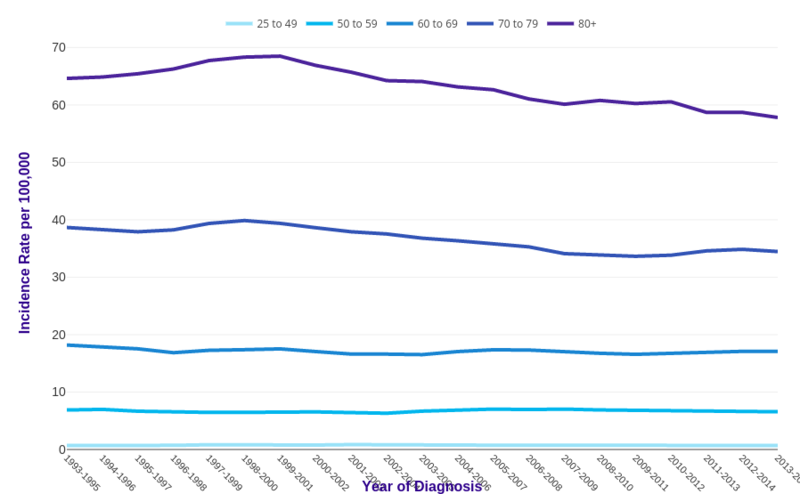 Oesophageal cancer incidence rates have remained stable overall in some broad adult age groups in females in the UK since the early 1990s, but have decreased in others. [1-4] Rates in 25-49s have remained stable, in 50-59s have remained stable, in 60-69s have remained stable, in 70-79s have decreased by 11%, and in 80+s have decreased by 11%. For oesophageal cancer, like most cancer types, incidence trends largely reflect changing prevalence of risk factors and improvements in diagnosis and data recording. Recent incidence trends are influenced by risk factor prevalence in years past, and trends by age group reflect risk factor exposure in birth cohorts. Data is for UK, 1993-2015, ICD-10 C15. National Cancer Registration and Analysis Service. Stage Breakdown by CCG 2014. London: NCRAS; 2016. Data is for UK, 2010-2012, ICD-10 C15. There are two main histological types of oesophageal cancer: squamous cell carcinoma (SCC) and adenocarcinoma (AC) . While ICD-10 codes specify the anatomical location of the tumour, histological types within that location are distinguished using ICD-O morphology codes: SCC is ICD-O M805-M808, and AC is ICD-O M814-M838. SCC accounted for more than a quarter (28%) of all oesophageal cancer cases, while AC accounted for more than half (55%) in England in 2008-2010. In the upper and middle sections of the oesophagus most cases (62%) were SCC, while in the lower section most cases (70%) were AC, in England in 2008-2010. Tobacco use increases the risk of both SCC and AC. SCC is also strongly linked with alcohol consumption, while AC is linked with excess body weight, and long-term acid reflux (which can lead to the pre-cancerous condition Barrett’s oesophagus). The male:female incidence rate ratio for oesophageal cancer as a whole is 27:10. However, the male:female incidence rate ratio for AC is higher, around 52:10 and the male:female incidence rate ratio for SCC is lower, around 11:10. European age-standardised (AS) incidence rates for SCC have remained stable for both males and females in England between 1995-1997 and 2008-2010. For males, AC rates have increased by 52% in this period, from 6.2 to 9.4 per 100,000 males. For females the rise in this period is smaller, with rates increasing by 32%, from 1.4 to 1.8 per 100,000 females. This reflects the incidence trends observed in most western countries since the 1970s, where SCC rates have remained stable or decreased, while AC rates have increased, particularly in men. Data were provided by the Office for National Statistics on request, July 2013. Similar data can be found here: http://www.ons.gov.uk/ons/rel/vsob1/cancer-statistics-registrations--england--series-mb1-/index.html. Vizcaino AP, Moreno V, Lambert R, et al. Time trends incidence of both major histologic types of esophageal carcinomas in selected countries, 1973-1995. Int J Cancer 2002;99(6)860-8. Oesophageal cancer incidence rates are projected to fall by 3% in the UK between 2014 and 2035, to 18 cases per 100,000 people by 2035. This includes an increase for females and a drop for males. For males, oesophageal cancer European age-standardised (AS) incidence rates in the UK are projected to fall by 6% between 2014 and 2035, to 25 cases per 100,000 by 2035. For females, rates are projected to rise by 1% between 2014 and 2035, to 11 cases per 100,000 by 2035. It is projected that 12,657 cases of oesophageal cancer (8,366 in males, 4,292 in females) will be diagnosed in the UK in 2035. There is evidence for an association between oesophageal cancer incidence and deprivation for both males and females in England. England-wide data for 2006-2010 show European age-standardised incidence rates are 59% higher for males living in the most deprived areas compared with the least deprived, and 50% higher for females. 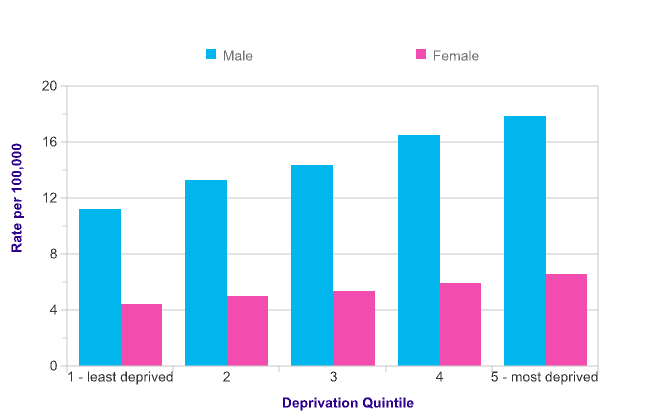 The estimated deprivation gradient in oesophageal cancer incidence between people living in the most and least deprived areas in England has widened for males in the period 1996-2010, but it has not changed for females. It has been estimated that there would have been around 1,200 fewer cancer cases each year in England during 2006-2010 if all people experienced the same incidence rates as the least deprived. Age-standardised rates for White males with oesophageal cancer range from 13.9 to 14.4 per 100,000. Rates for Asian males are significantly lower, ranging from 3.6 to 6.1 per 100,000 and the rates for Black males are also significantly lower, ranging from 6.0 to 10.2 per 100,000. For females there is a similar pattern - the age-standardised rates for White females range from 5.5 to 5.7 per 100,000, and rates for Asian and Black females are also significantly lower, ranging from 2.5 to 4.5 per 100,000 and 2.1 to 4.5 per 100,000 respectively. Ranges are given because of the analysis methodology used to account for missing and unknown data. For oesophageal cancer, 31,517 cases were identified; 16% had no known ethnicity. An estimated 15,600 people who had been diagnosed with oesophageal cancer between 1991 and 2010 were alive in the UK at the end of 2010.